The US government uses enormous corporate fines to strenghten its economy and play the role of world's financial police force. The ongoing diesel scandal may cost Volkswagen up to $18 billion in the US. This is going to be one of the largest settlements between a company and the US government. Washington has imposed enormous penalties on companies and banks to play the role of world financial gendarme, according to an article on Gazeta.Ru. Recently, it was revealed that around five million Volkswagen passenger vehicles worldwide operate with software that cheats emission tests. Volkswagen’s diesel cars were found to be emitting up to 20 times more greenhouse gases than they reported. The software allowed for cheating during smog-emission tests, and lowering the pollution rate. These emission controls then turned off during regular use. 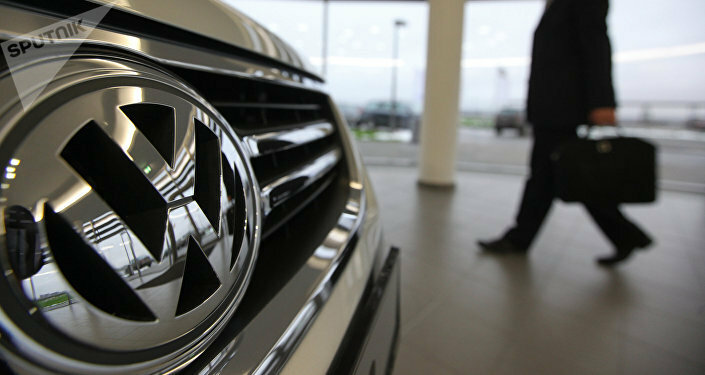 The US Environmental Protection Agency (EPA) is forcing the German automaker to recall 500,000 models. This is not the first time the US government has revealed scandalous violations in business activities and applied penalty measures accordingly. If the enormous criminal fine is laid against VW it would the second-largest settlement ever, after the $18.7 billion penalty against oil company BP for the oil spill in 2010. There is no doubt that fines imposed by the US regulator aim to uphold the law and to punish those responsible for any violations. At the same time, with such enormous penalties the US government increases its budget income and interferes with global competition, the article read. For instance, VW’s 'Dieselgate' is likely to ruin company’s plans to dominate the US market and strengthen its global leadership position. The US is a lucrative market for any company in the world. The population of the country is over 300 million. The US GDP per capita is $54,600 (as of 2014), and the average household income is $53,700. The government adopted the practice to impose penalties on banks (mainly foreign) for working with countries under US economic sanctions. The largest fine, $9 billion, was imposed on French BNP Paribas for transactions with Iran, Sudan and Cuba. The US has also gathered a rich crop of fines after the world financial crisis of 2007-2008. The largest mortgage settlement of $16.7 billion was reached by the government with Bank of America. In addition, JP Morgan Chase agreed to pay $13 billion, and Citigroup — $7 billion. Currently, the US is working on a number of cases against international corporations and banks, with possible penalties ranging from several dozens of millions to dozens of billions dollars. Among the companies under the investigation are Total, General Motors, Alstom, Deutsche Bank. Another example of the US playing the role of world financial police force is the Washington-spearheaded anti-corruption campaign against FIFA. The question now is not about the lawfulness of such a policy. It is an accomplished fact – in the contemporary world there are no more traditional borders, and any international company can be targeted by the state it works with, the article read. However, the US’s policy deprives other actors (states or companies) of their right to defend their financial sovereignty and competitiveness capabilities. How long will the US use corporate fines to patch the holes in its budget? And will other countries ever abandon their wait-and-see approach?